Hear from Collingwood's five development coaches - Craig McRae, Dale Tapping, Steve Grace, Tarkyn Lockyer and Anthony Rocca - as they explain the importance of fast-tracking the progress of the club's young stars. Hear from Collingwood's five development coaches - Craig McRae, Dale Tapping, Steve Grace, Tarkyn Lockyer and Anthony Rocca - as they explain the importance of fast-tracking the progress of the club's young stars. 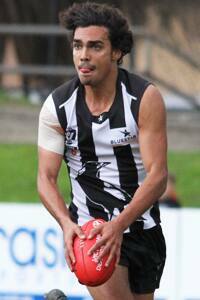 Tony Armstrong sends Collingwood into attack during last week's loss to the Northern Blues. Photo: Shane Barrie. It was a tale of two different groups of players perfectly blending together at Victoria Park on Saturday as Collingwood defeated Werribee by 31-points. On one hand, the familiar names of Ben Reid, Alex Fasolo, Lachlan Keeffe and Brodie Grundy proved their worth in a bid to receive an AFL call up. On the other hand were the lower profile types who held up their end of the bargain. Ryan Pendlebury stood tall in defence, Caolan Mooney sped around opponents and Ben Moloney gathered the ball at will. Coach Dale Tapping told collingwoodfc.com.au post-match that the harmony between the AFL and VFL listed players is an ongoing focus. “We’ve worked really hard with our VFL players and our AFL players to find a good connection. We like to think we’re a tight group and there’s respect for each other,” Tapping said. “We demand that the boys play together and they play team footy. In wet conditions at Victoria Park, Collingwood controlled the majority of the play and restricted the Tigers to just a solitary behind in the opening term. Remarkably, it wasn’t until around the 25 minute mark of the second quarter that Werribee kicked its first major for the day. In a bizarre third term, Collingwood dominated possession and peppered the goal face, but could manage just one goal from 11 scoring shots in a scrappy quarter of football. Yet as the heavens opened in the final term, so did the game. After allowing Werribee to kick the first goal of the quarter, majors to Tim Allan, Kyle Martin and Jack Hellier ensured there would be no last quarter fight back. After a final quarter fade out against the Northern Blues last week, Tapping was pleased with today’s four quarter performance. “I thought right from the first minute we executed what we needed to do. The conditions made it tough, so you had to be really committed physically and I thought our boys did that really well. With the return of Reid and Fasolo on the minds of the many in attendance at Victoria Park, both performed well before being rested in the final term. Tapping says both will now step up their game time in an attempt to press for senior selection. “I think both of them will take a lot of confidence out of playing and getting through today,” he said. "Ben played three quarters which he was scheduled to do. He moved freely and I think he’ll take a lot of confidence out of that...he was adamant all week that he would play and he did and was really good. With both the VFL and AFL teams scheduled for a bye next weekend, Tapping's side will have a fortnight to prepare for its next assignment against Frankston at Frankston Oval on Saturday 2 August.